The success of our clients says it all. Here are some of our clients and the results we have achieved together – weight loss – practice walking on a leash – the end of bad habits! We will customize a solution to make your dog healthier and happier – tell us the challenge you are facing and we will improve your lives. Challenge: Dixie’s family is very busy during the week. 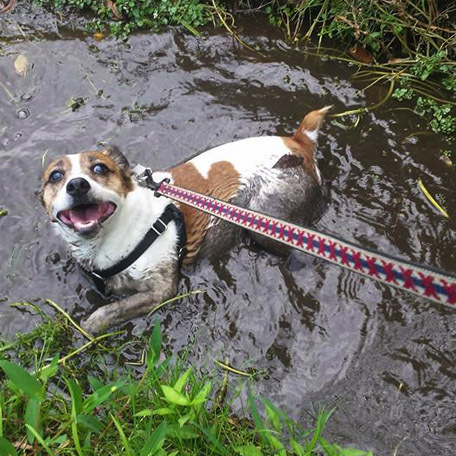 Dixie is a very energetic and athletic dog who needs a lot exercise and needed to lose weight. She also needs sitting when her family is away. Solution: 60 minutes on the trails with a combination of jogging and hiking. 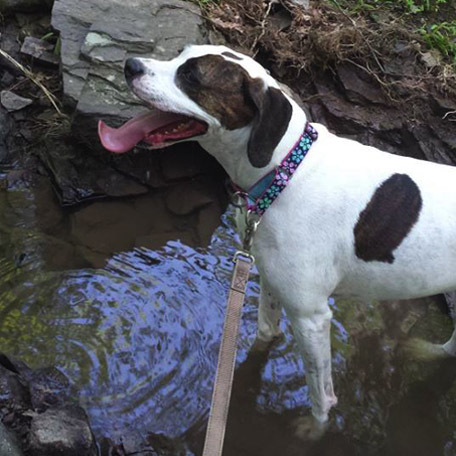 Dixie likes a mission and needed a partner on a trail to really exercise. And, in home pet sitting complete with fun and exhausting playdates. 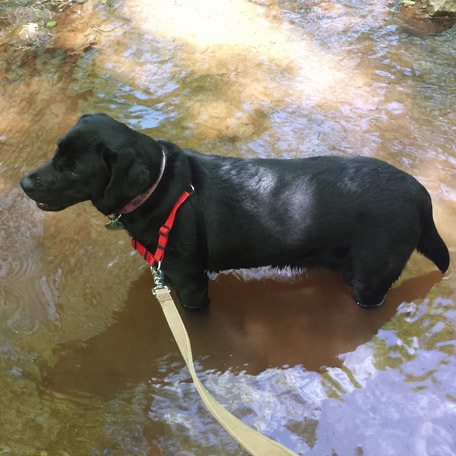 Result:Dixie lost four pounds and gets the exercise she needs. 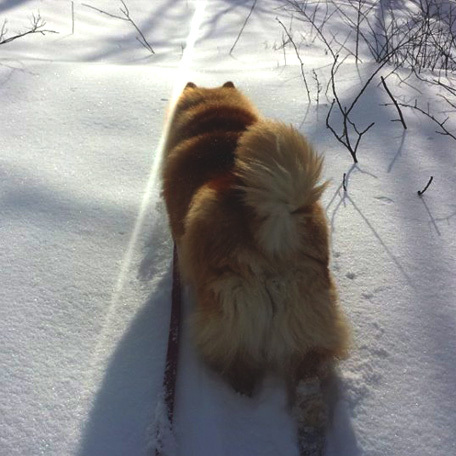 An added benefit, the family returns home to a relaxed and well exercised dog. When her family is away she is well cared for and in the comfort of her home. A little more about Dixie: Dixie is sweet and serious. 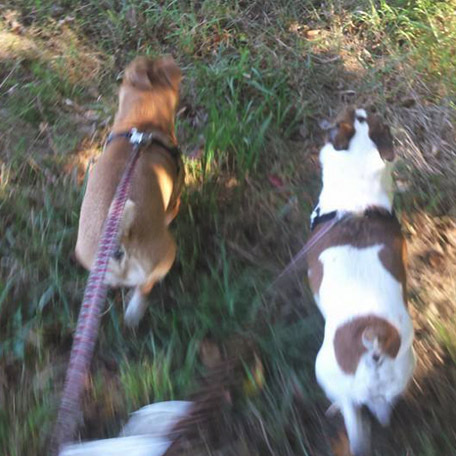 Dixie has the distinction of being the first member of the Rover Runs pack. She loves to run and is chomping at the bit for the first 30 minutes of every outing, no matter how fast we are running. Dixie does not like rain and does not enjoy the cold weather or snow. She still runs in the cold though, and she will run out of her house very eager to get out on the trails. But if it’s raining or snowing, forget it! Nicknames for Dixie include, Delicate Flower and Dixie Doodle Doo. Challenge: Koda needed exercise and was home alone too long on weekdays. He needed a break and an outlet for his energy. Solution: Sessions every weekday. He needed a walk some days and time on the trails for running and exploring on the other days. Result: A more relaxed dog when his family returns. He now has the relief of a break in the middle of the day, and the bonus of the fun and exercise he was missing. 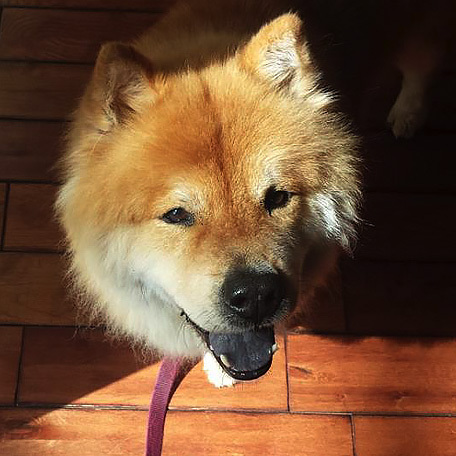 A little more about Koda: Koda is happy and loving. 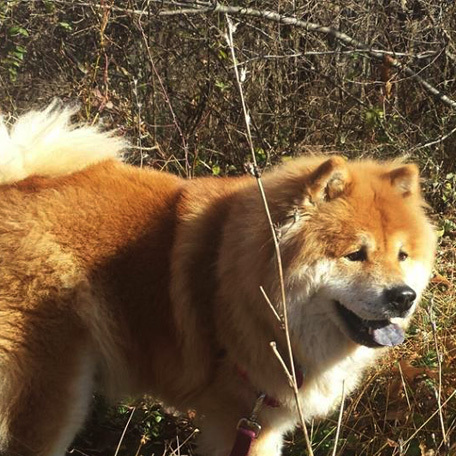 He is my first experience with a Chow Chow and has made me an admirer of the breed. Koda has a wonderful happy dance, and there is no mistaking his joy and elation upon my arrival. I think it is that much more special since he is sometimes hard to read and aloof. Koda loves to wander off trail, adores being dried with a towel and tries to nonchalantly guide me past the house when we return from our outings. His is photogenic and beautiful. My nickname for him is Koda Bear. Challenge: Bibi needed time practicing leash manners and exercise on the trails. 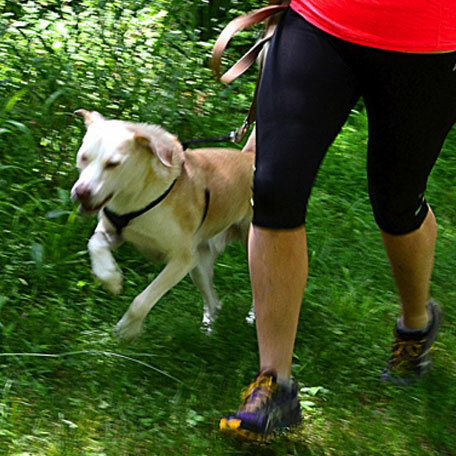 Solution: Hour long sessions on the trails a few times a week with lots of practice walking nicely on a leash. 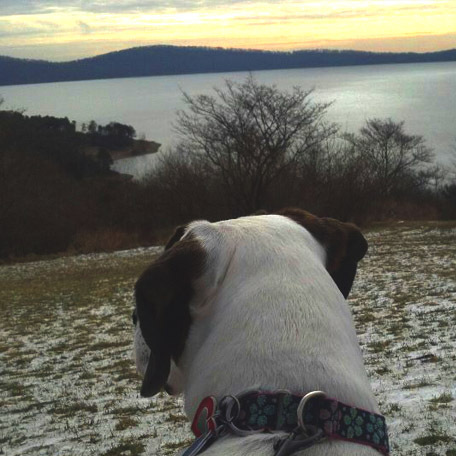 Result: Bibi is learning leash manners and loves our adventures in the woods! The most important aspect of training is practice and we reinforce walking nicely on the leash the entire time we are out on the trails. A little more about Beatrice: Bibi is the youngest member of our pack. She is a joy and her enthusiasm is infectious. When I arrive to pick her up she zooms around the house in excitement. Although she is a very sensitive girl, Bibi is affectionate and silly. 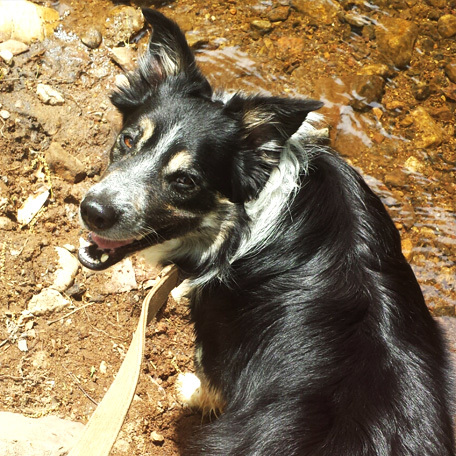 We hike and jog in a park with a river, Bibi loves whenever our trail gets close to the river – she knows and picks up the pace. 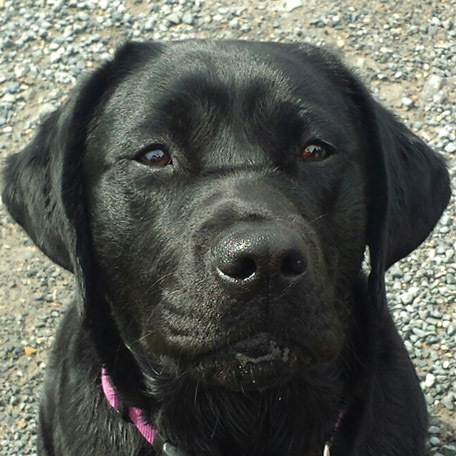 Bibi is very smart and like a lab, she is always checking in with eye contact during our time on the trails. It’s no secret that I have a special spot in my heart for black labs. My nickname for Bibi is The Bees Knees. 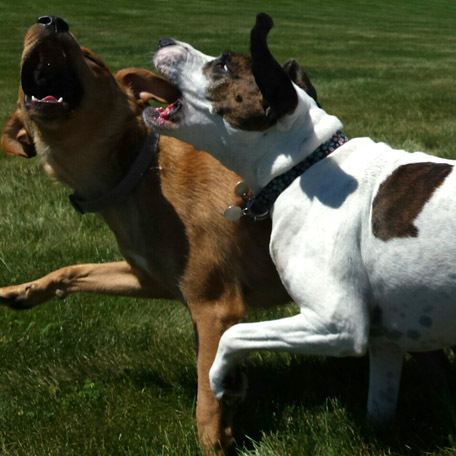 Challenge: A lack of exercise lead to excessive energy and nuisance barking. He also needed practice greeting new dogs. Solution: We customized a program that includes a combination of hiking and jogging the trails three times a week for 30 – 60 minutes. Result: Ollie doesn’t nuisance bark anymore! He can calmly watch the neighbors and the mail carrier pass the house without barking. 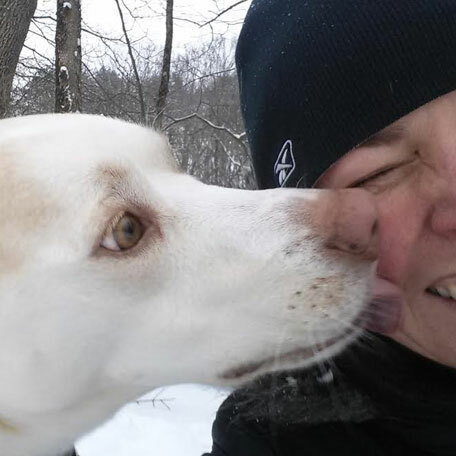 He also gets the opportunity to meet new dogs on the trails and practice greeting them nicely. 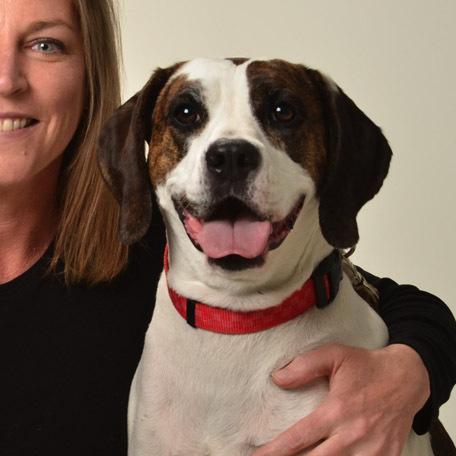 A little more about Ollie: Ollie is playful and smart. He is a hunter at heart and is always on the lookout for something. 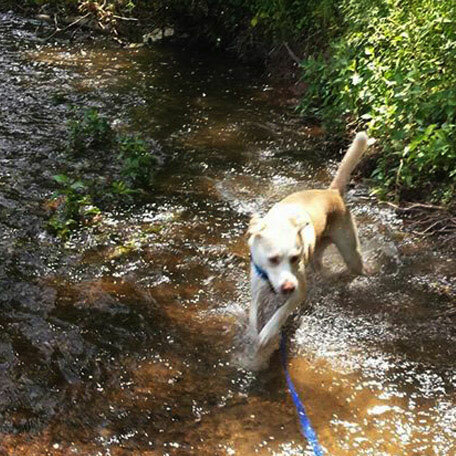 He likes to chase anything, including a leaf floating down the river. 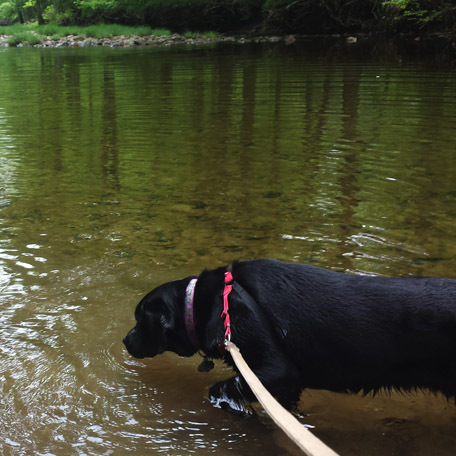 We spend the majority of our time together along the South Branch of the Raritan River, one of my favorite spots. If Ollie thinks we haven’t done enough during a session, he will avoid the direction of the car. It is always good to see Ollie! 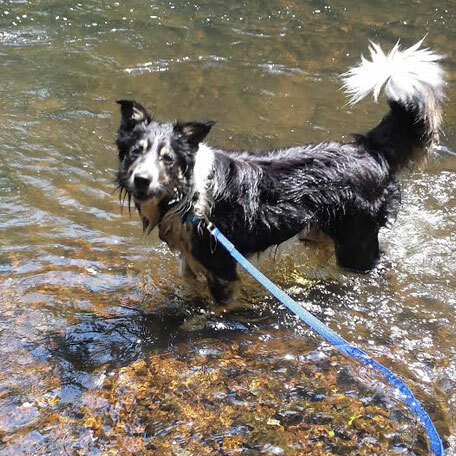 Challenge: True to the nature of a Border collie, Dallas needs a lot of exercise. Result: Dallas has an outlet for his energy and is having a lot of fun! 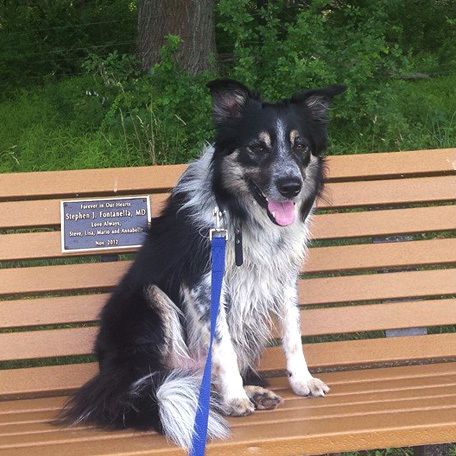 His family reports that they return to a relaxed dog on days when Rover Runs takes him out on the trails. A little more about Dallas: Dallas is energetic and fun. 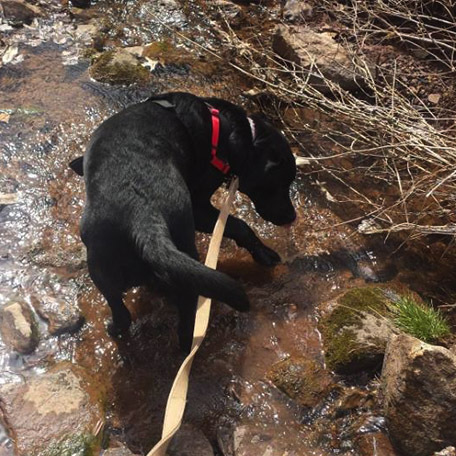 He loves to hike and run and has boundless energy. Although usually reserved with affection, upon arrival Dallas has a spirited happy dance followed by a single lick to the face. Then he is ready to go. 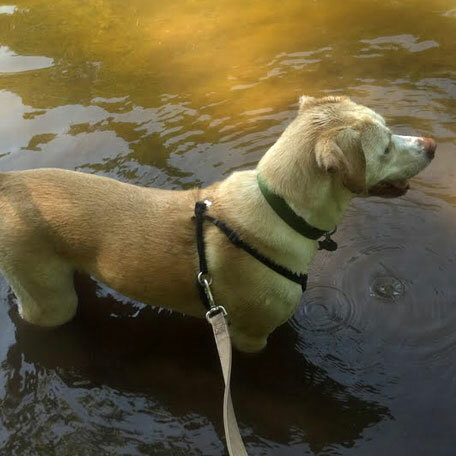 Dallas loves to swim and play fetch, especially when they are combined. One of his favorite parts of our adventures is being dried with a towel – he wiggles and gives kisses through the whole happy process. 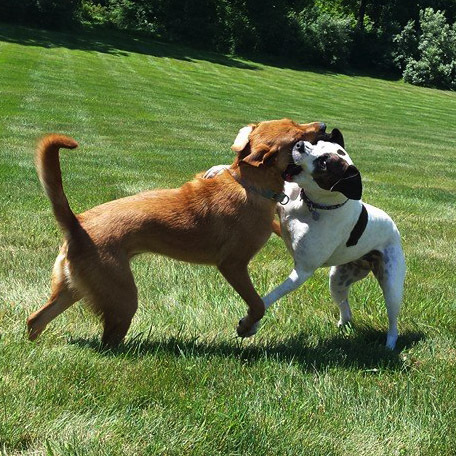 Challenge: These brothers didn’t have many opportunities to leave their large fenced in yard. Also, they were becoming aggressive with each other on leash. Result: These brothers don’t fight at all anymore! The boys are too distracted by the fun that awaits them and love their running adventures. 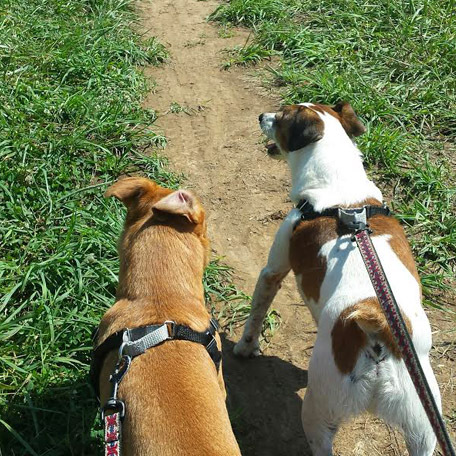 A little more about Cooper & Miles:Typical Jack Russell terriers, they could run for hours. On every outing they investigate every possible critter hole we encounter. They are funny, natural comics that keep me laughing. Miles loves to roll in the mud and can take a long time to clean up upon return. Cooper is younger but more serious and very loving. When they see me drive up they don’t bark, they get ready for their adventure.